Jammy and Sonny McGann are brothers from the notorious Ghost estate. They and their friends are always there for each other - and with the drugs and violence that dominate the place where they live, they need to be. In particular, Sonny needs his older brother to keep an eye out for him and make the plans for their group. Then Jammy and his mate Tommo join the army and go off to Afghanistan, and Sonny's left to hold the fort at home. With his brother no longer there to look after him, can Sonny keep it together? And when Jammy returns, how will things change? Phil Earle is making a name for himself as one of the grittiest writers of teen fiction out there today, and this is no exception. For the first part of the book, we go back and forth between scenes on the Ghost estate as Sonny runs into problems with a local gang and has to hide from the police, and scenes in Afghanistan as Jammy tries to cope with going to war. All of this is compelling reading and the two narrators have strong voices which really drew me into their stories. Each of their stories also benefits from good supporting characters, especially Sonny's girlfriend Cam - Tommo's sister - and Tommo himself and more experienced solider Giffer. In addition, both strands of the story are well-plotted and completely believable, in particular the incredibly tense parts as Jammy and Tommo go house to house searching for explosives and weapons. The book falters ever so slightly at around the halfway point, where Jammy returns home. While the portrayal of Jammy is superb, and extremely harrowing, Sonny seems to become less interesting, spending too much time repetitively whining about how everyone prefers his older brother. However, Earle gets things back on track fairly quickly, and gives us a stunning climax which makes this one a definite recommendation. 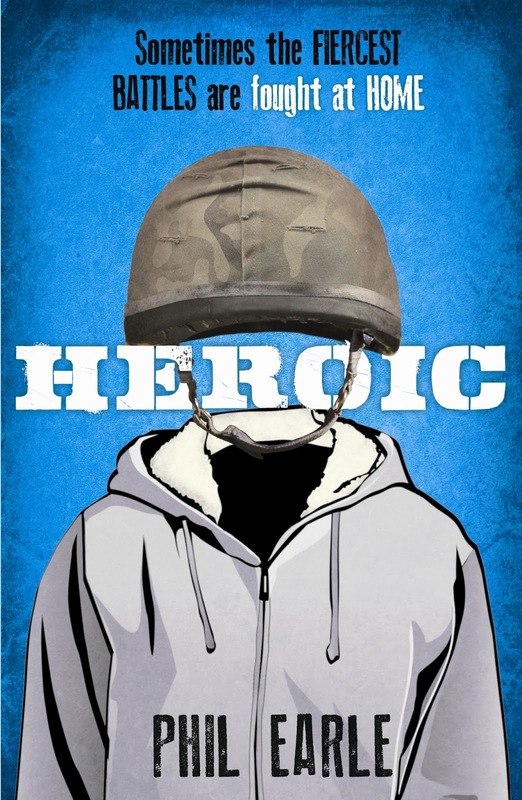 Phil was kind enough to talk to me about the cover for Heroic - check it out here.